https://www.youtube.com/watch?v=ztBF47qYY2o[/embed] Given that half of the world’s natural disasters occurred in the Asia Pacific last year and approximately 25 per cent of the world’s conflicts have occurred in this region, the establishment of the HADR Programme is indeed very timely and relevant. With the recent establishment of the Changi Regional HADR Coordination Centre (RHCC), the HADR Programme at RSIS leverages Singapore’s strategic position as a hub for regional cooperation in HADR efforts. Dr Noeleen Heyzer, social scientist, former Under-Secretary General of the United Nations (UN) and one of Singapore’s leading experts on HADR, delivered the keynote address. The highest ranked Singaporean in the UN, Dr Heyzer has extensive on-the- ground experience in HADR through her various roles at the UN. She was personally involved with three major disasters in the region – the devastating tsunami in Aceh, Cyclone Nargis in Myanmar, and the 2011 floods in Thailand. On the importance of HADR, Dr Heyzer said, “This programme has a critical role to play, not only in deepening the understanding and improving the capacity of actors in the region in humanitarian crises and effective response. It also facilitates the emergence of a new humanitarian model of partnership by bringing together multiple stakeholders to forge solutions and partnerships in response to humanitarian crises of today and tomorrow.” The HADR Programme uses a multi-dimensional and holistic approach in assessing humanitarian aid and emergency preparedness capacities in the region. Issues such as community protection and assistance, the identification of new and emerging humanitarian actors, lessons learnt from past HADR experiences, and the opportunities and challenges for HADR cooperation in the region fall within the mandate of the HADR programme. The HADR Programme will create new knowledge through interdisciplinary and policy-relevant HADR research so as to attract, retain and support world-class academic investigators to perform high quality and high impact research in Singapore on HADR. Against a backdrop of intensifying disasters in the Asia Pacific, exacerbated by global climate change and persistent fragilities affecting communities in the region, the role played by humanitarian actors is now more pivotal than ever. 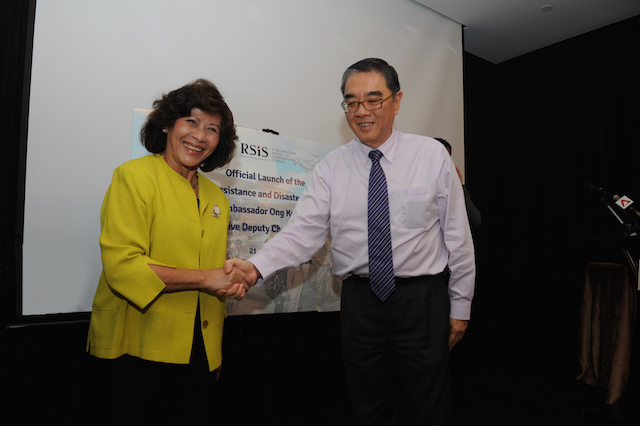 In light of the need to enhance coordination among civilian government agencies, militaries, NGOs, faith-based organisations and civil society groups to support and strengthen their responses to those in need, the S. Rajaratnam School of International Studies (RSIS) launched the Humanitarian Assistance and Disaster Relief (HADR) Programme on 21 July 2015. Given that half of the world’s natural disasters occurred in the Asia Pacific last year and approximately 25 per cent of the world’s conflicts have occurred in this region, the establishment of the HADR Programme is indeed very timely and relevant. With the recent establishment of the Changi Regional HADR Coordination Centre (RHCC), the HADR Programme at RSIS leverages Singapore’s strategic position as a hub for regional cooperation in HADR efforts. Dr Noeleen Heyzer, social scientist, former Under-Secretary General of the United Nations (UN) and one of Singapore’s leading experts on HADR, delivered the keynote address. The highest ranked Singaporean in the UN, Dr Heyzer has extensive on-the- ground experience in HADR through her various roles at the UN. She was personally involved with three major disasters in the region – the devastating tsunami in Aceh, Cyclone Nargis in Myanmar, and the 2011 floods in Thailand. The HADR Programme uses a multi-dimensional and holistic approach in assessing humanitarian aid and emergency preparedness capacities in the region. Issues such as community protection and assistance, the identification of new and emerging humanitarian actors, lessons learnt from past HADR experiences, and the opportunities and challenges for HADR cooperation in the region fall within the mandate of the HADR programme. The HADR Programme will create new knowledge through interdisciplinary and policy-relevant HADR research so as to attract, retain and support world-class academic investigators to perform high quality and high impact research in Singapore on HADR.